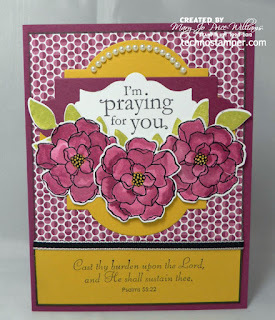 Two in One--be sure to see both cards! Easy Peasy! And cute too! Spring Fever in the middle of the Winter! One more with the same set and leftovers! 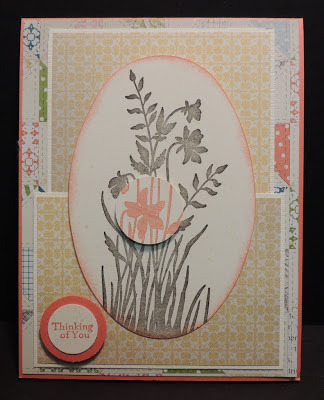 Not my favorite cards to make--and not ones that I generally make at the time I need--I usually like to have them on hand. With that being said my supply is low--since I like to have a variety on hand so I can pick one that fits--hence today's post. Have you noticed that I am sooooo stuck in this color palette. I just love it. It certainly helps when you get the DP that matches for free--SAB is awesome! 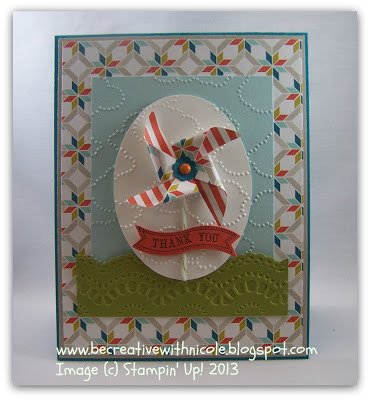 Lot going on today so my post is short and sweet. 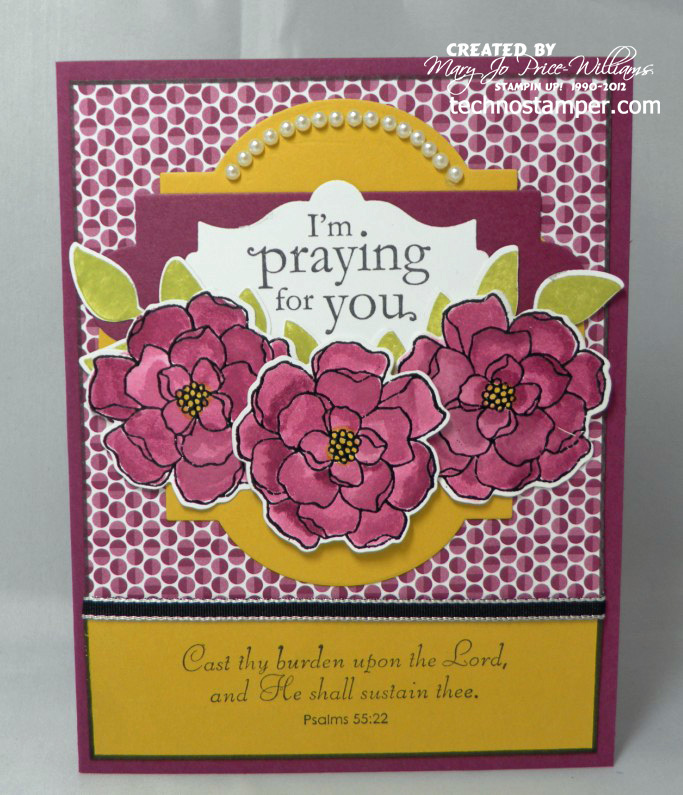 I have two challenges to share with you today--I did not combine them, rather I have two cards to share. So be sure to scroll down to see them both. 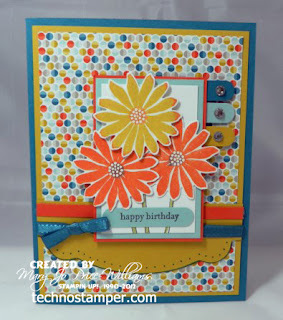 The first one is for the LNS challenge for this week--to use heat embossing on your card. 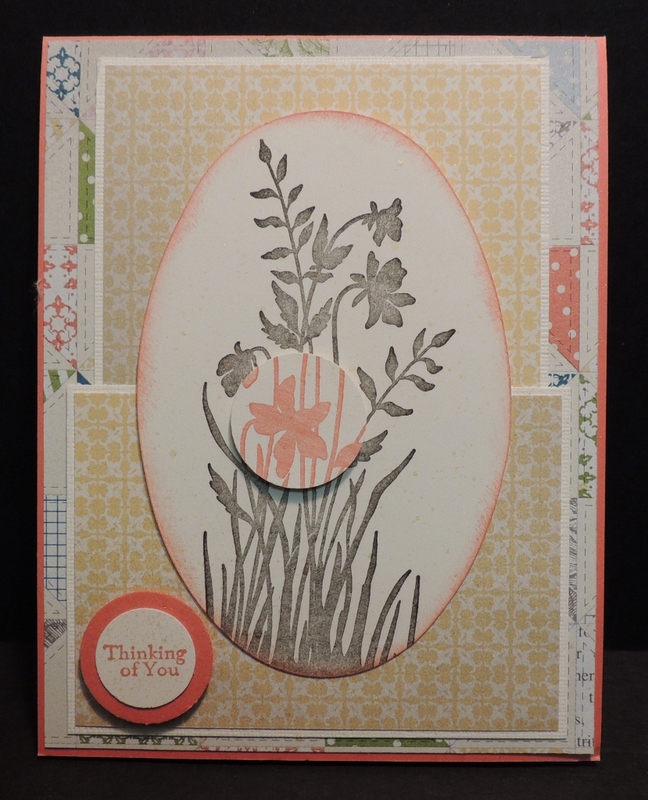 I chose to embossed the beautiful flowers from the Secret Garden Set and then water color with re-inkers. Details can be found at end of post. 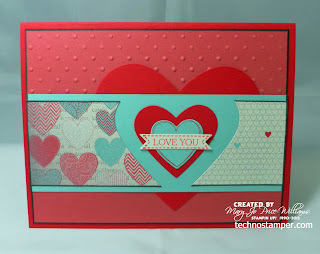 I really think I need to be done with Valentine/Love cards as I really NEVER send them--hmmmm, what do you think that says about me??? Hope you have a wonderful HUMP day! 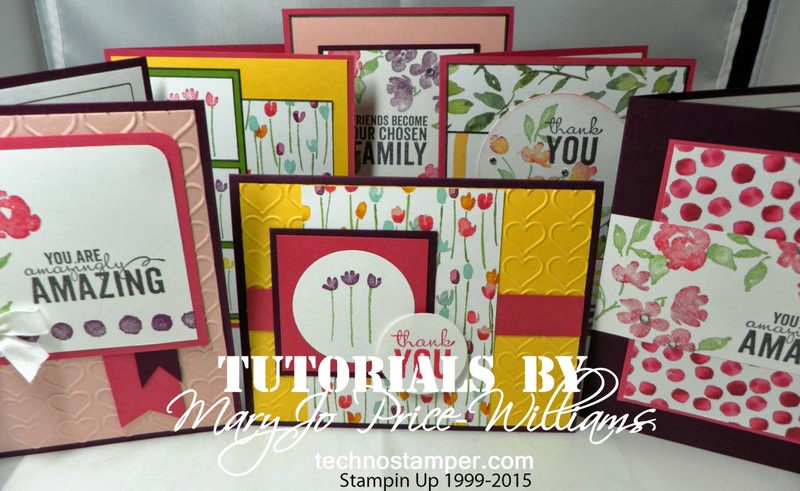 If you are looking for the Try Stamping on Tuesday post you can find it HERE. 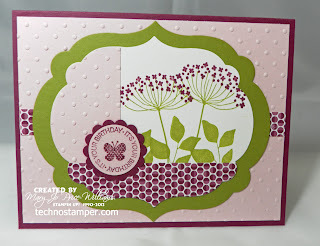 I could not resist playing along with today's color challenge on Splitcoaststampers. They are calling it--Lucky Island Delight. 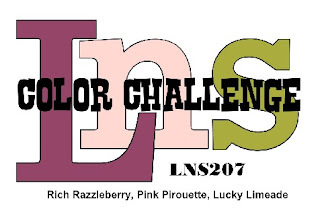 I bet you can figure that we are using the colors Lucky Limade, Island Indigo and Daffodil Delight. I just got a new deliver yesterday with lots of new stuff--even though I have not used all of the stuff from the last shipment yet, lol---shhhhhh don't tell my hubby! So I wanted to play with the Oh Hello Bundle. we are back and better than ever click HERE. I hope your day is off to a fabulous start! 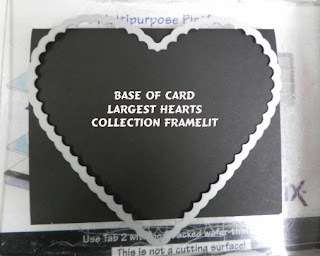 I had some fun playing with the different heart framelits. Isn't it cute. I love the big heart in the background--kind of hard to see as it almost blends in. 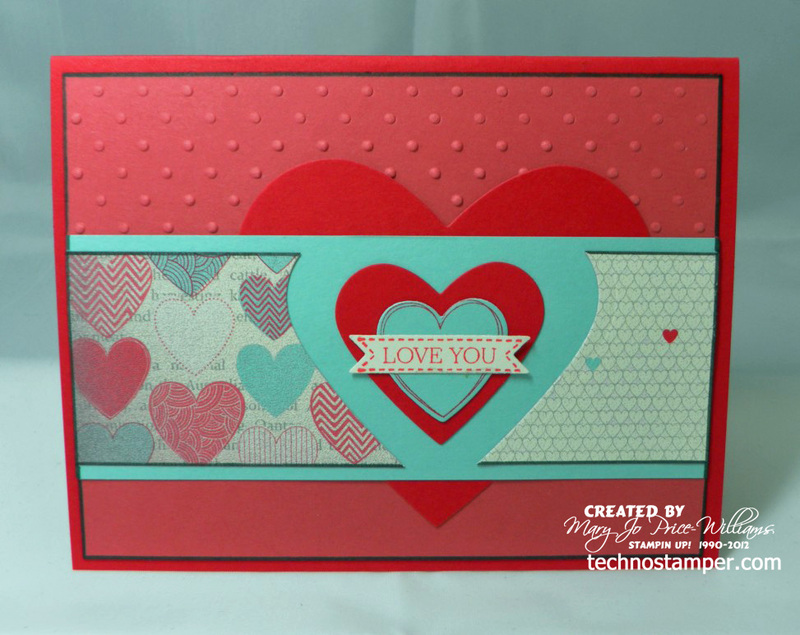 I didn't put a Valentine sentiment on here because I wanted to be able to use it anytime just to let someone special know I love them! Don't forget I started my Monday Lunchtime Sketch challenges again this week too! 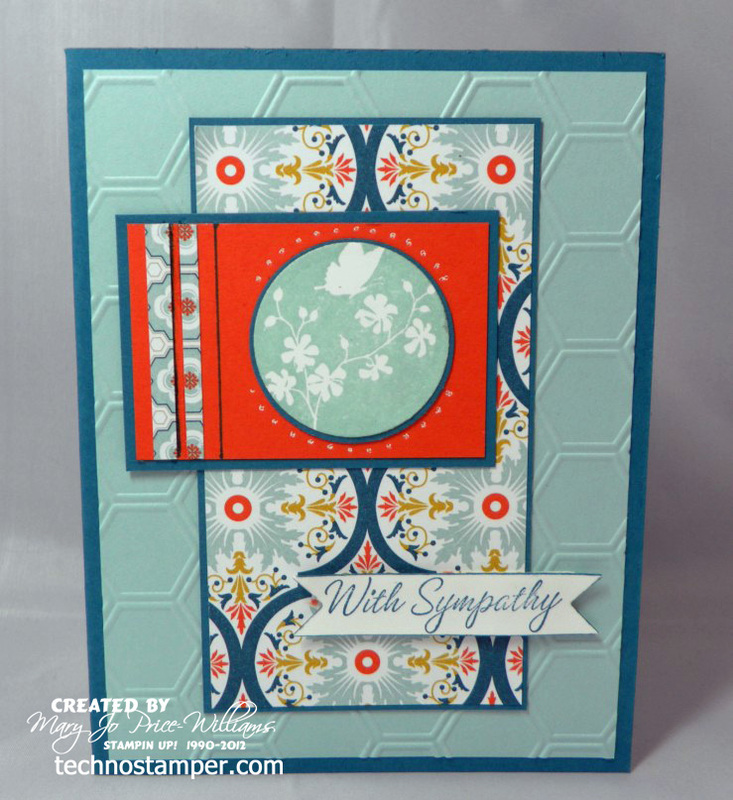 You can view this week;s sketch and the fabulous designs from the new Design Team HERE! Yippee! I am so excited to say that we are finally back up and running with my weekly sketch challenges! And we are better than ever--I have a new team of designers that are going to blow your socks of each and every week--I am amazed at the talent. You will love all the creative ideas. So be sure to play along and tell you friends to play along too! 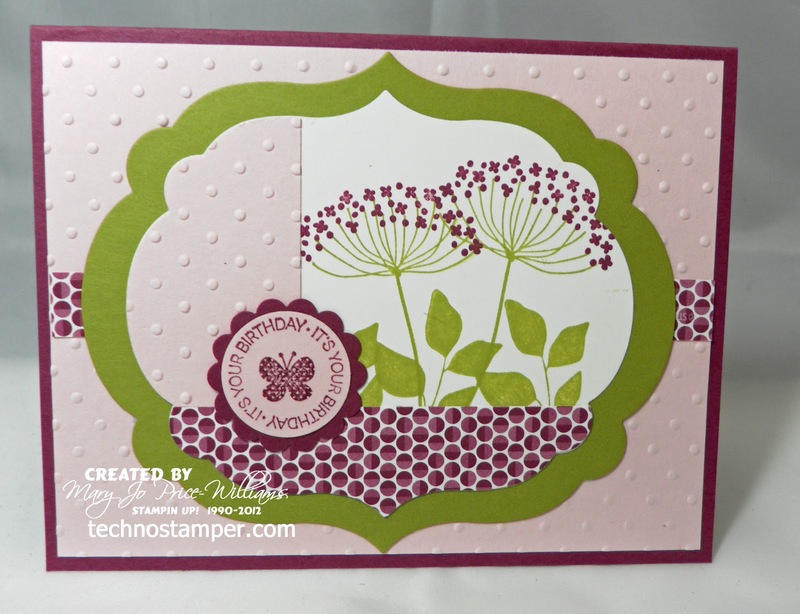 Here is my sample using the new Secret Garden Stamp set and matching dies. 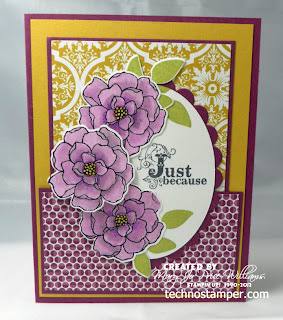 I also combined it with this week's LNS challenge to use heart embossing--the flowers are embossed in black. 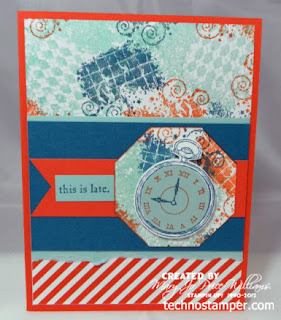 so get busy stamping and come on back and share with us on the linky tool below! Please note if you have purchased a tutorial from me in the last few weeks--or ever for that matter--that was blurry or not to satisfaction please let me know--after selling tons of them I had one person say that two of them were blurry--so I went in and downloaded them and seen that they did indeed get blurry when transferring to PDF. I sent a sample to my hubby and he said it looked great--go figure! 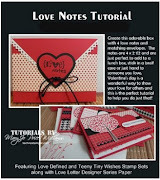 I have tried to e-mail anyone who may have purchased one of the tutorials in question but may have missed you. If I did please let me know. Again if you ever have an issue with a tutorial please let me know as soon as possible--I will not be offended--I will be very appreciative. 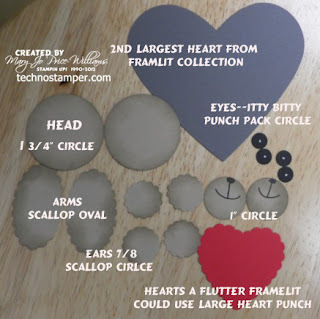 I have sent a free tutorial to everyone who got one of the blurry ones along with the clear version of the original. Thanks so much for all the purchases I truly appreciate them. So much to do on the weekends so I made just one really quick card for the day! 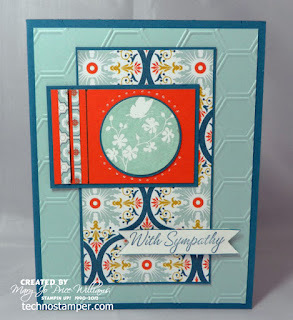 This is so quick mostly because the background paper includes the sentiment! 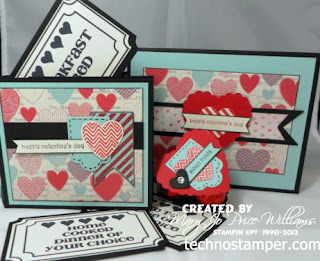 So no stamping the sentiment! 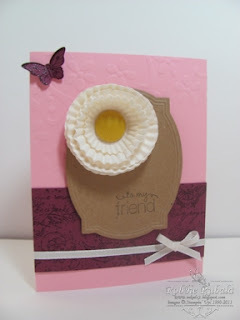 And it is so pretty--don't you think. 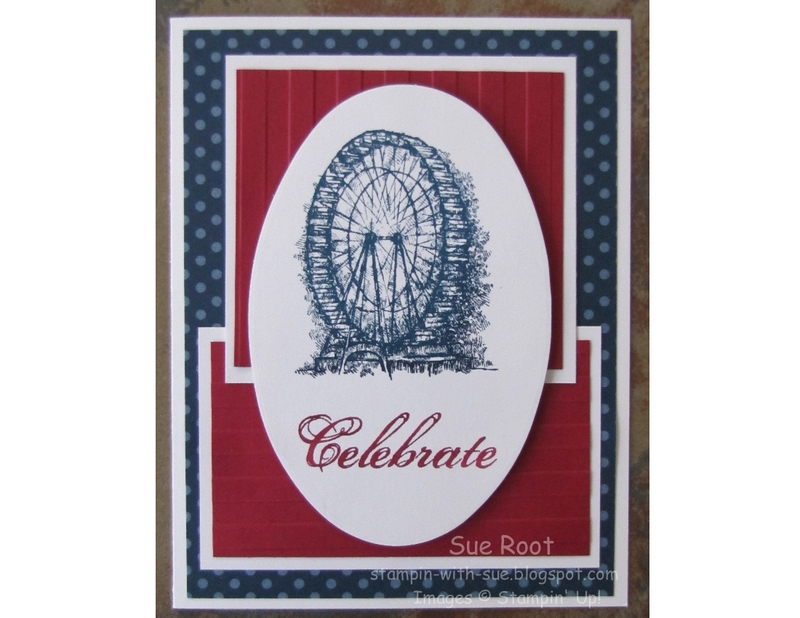 Clean and simple--only one image to stamp and it is in one color! 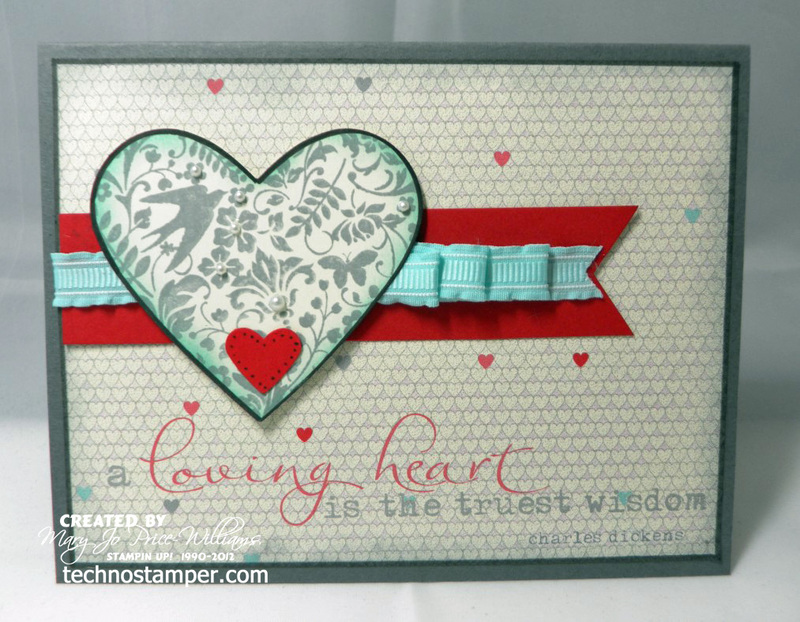 Did you even notice this beautiful saying on the bottom corner of the More Amore Specialty Designer Series Paper? I didn't--I actually pulled out the sheet expecting it to be all the same and was pleasantly surprised when I seen the beautiful wording on the bottom. 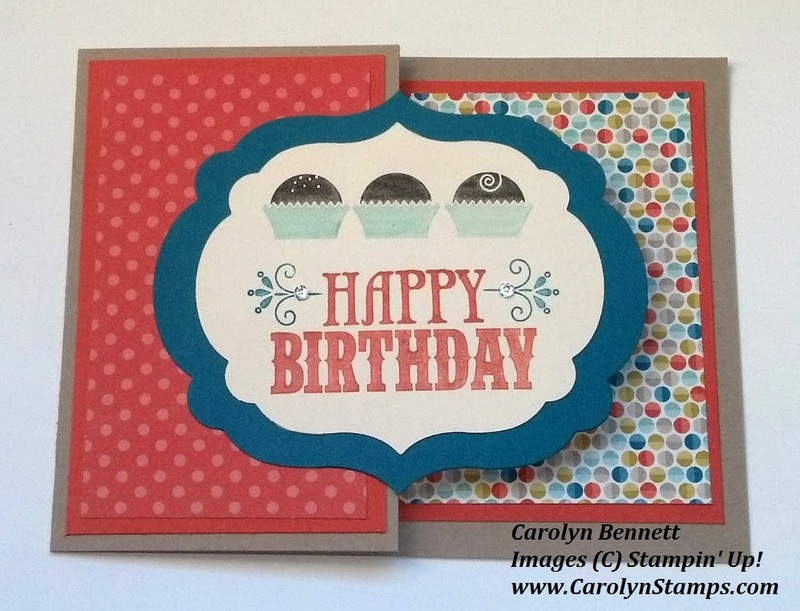 And it is the perfect size to fit across the bottom of a card--an added plus! Ink: Basic Grey, Pool Party (spoonged on edges of heart. will be starting back up this Monday! 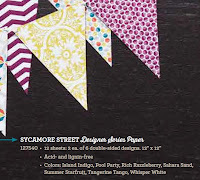 Please stop by to see the sketch and all the beautiful samples the team has for you. 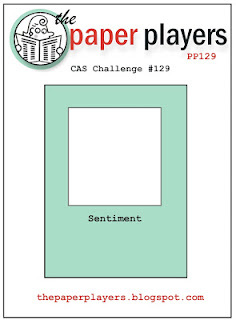 Then during the week create a card for the challenge and come on back and add it to the linky tool! 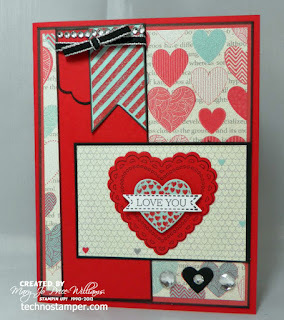 VALENTINES DAY--THE SEASON OF LOVE! here is what I can up with--not too bad considering the limited amount of images I had on the laptop to work with--I actually like it--and it was so easy I can change it out again and again and again and---well you get the idea! 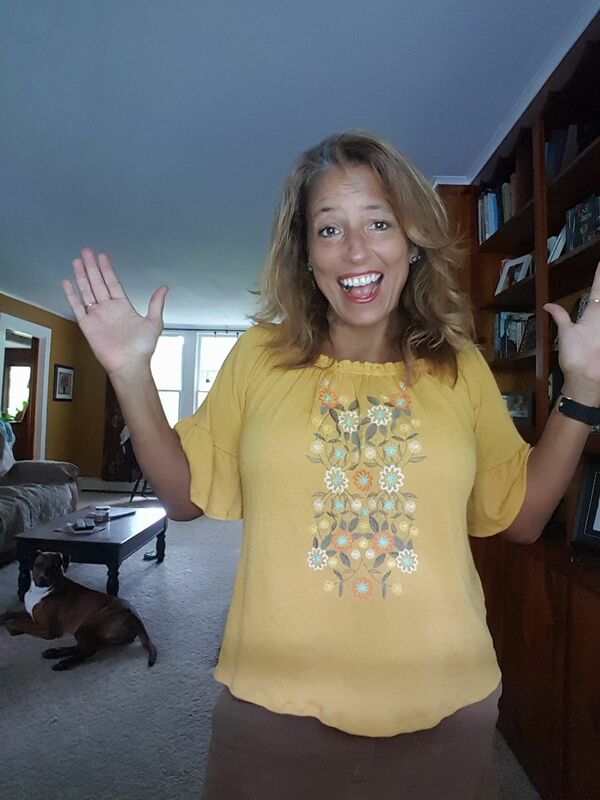 I do not have a Facebook business page--just my personal page--want to see it in "action"
This will fit perfect without stretching--if you make it smaller it will get stretched and if you make it too big it will not load. 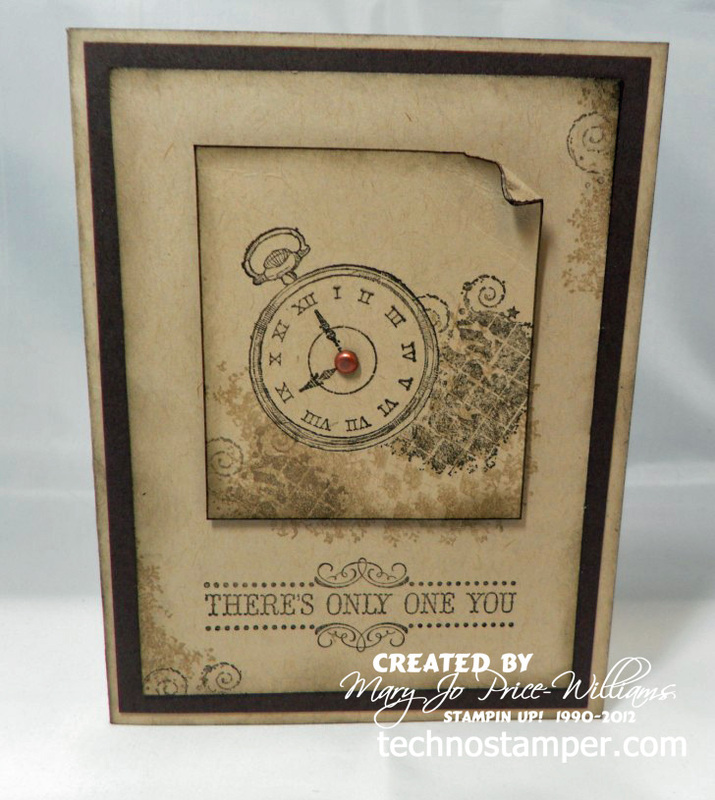 After you have your blank canvas just design like a mini scrapbook page or card front. 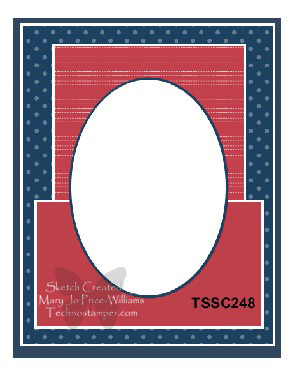 One thing to keep in mind is that this is a pretty small area when you add stamps or elements they are HUGE and need to be re-sized--you may need to move them around to find the corner to shrink--or you can always use the re-size tool but to me that is more difficult. Please feel free to ask if you have questions. But remember Blogger does not show e-mails unless you have your google account set to share--so leave a reply e-mail or check back for the answer in the comments section! I am back to playing with the Clockworks set. 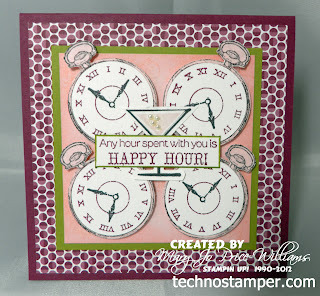 This time I combined it with the Happy Hour set for this cute card. The card is created for two challenges--LNS color challenge and the SCS sketch challenge! The card is a 4 1/4 inch square so it still fits in a regular envelope. 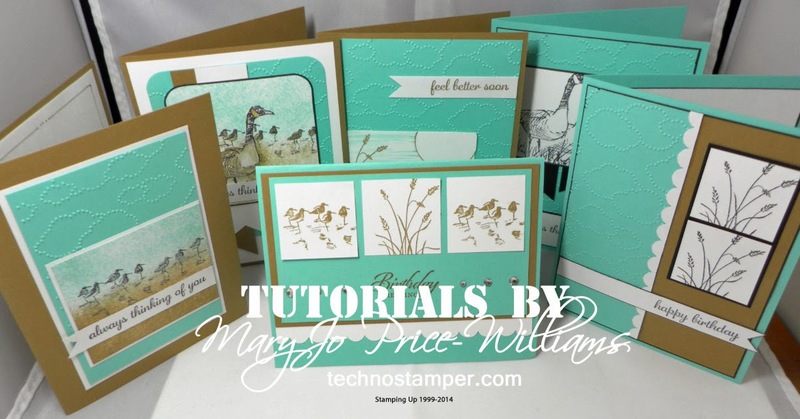 Did you check out my newest tutorials yet? and step by step directions! As always you get this all for only $2.50. 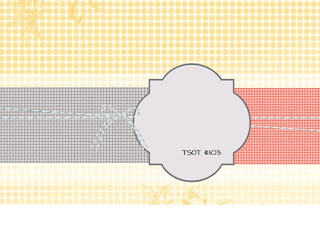 The booklet has six pages and four pockets to hold the eight coupons. 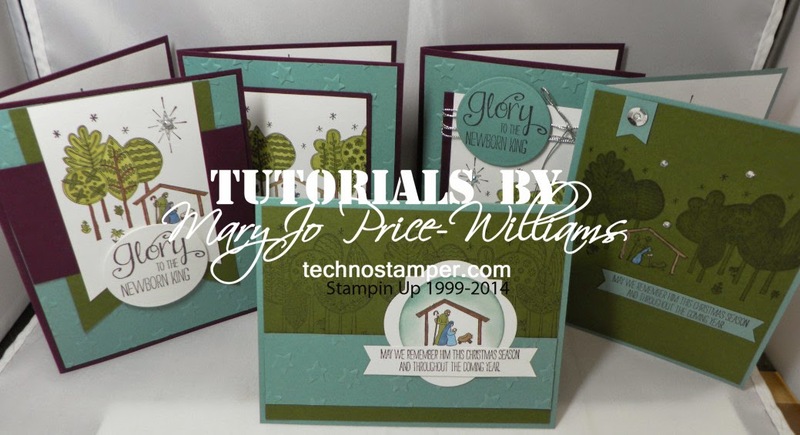 Step by Step directions--lots of pictures--can be used again and again. Automatically delivered to your e-mail after payment. Full color step by step directions to create the booklet, card and treat holder. Believe me you are going to love this! So easy and fun--and don't forget once you have the template you can use it again and again! 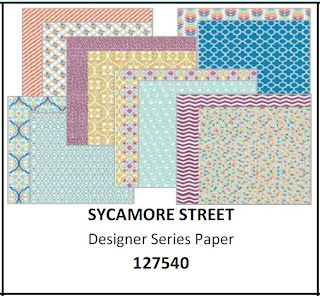 Just change out the papers and colors and it will be entirely different! You can get this tutorial NOW for only $2.50! 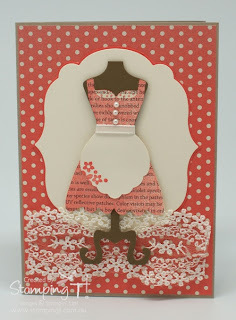 Since today is the first day of Sale-A-Bration I thought I would share a brand new tutorial with you! 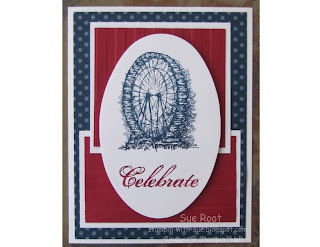 It is using two of the products that you can get for FREE during Sale-A-Bration! 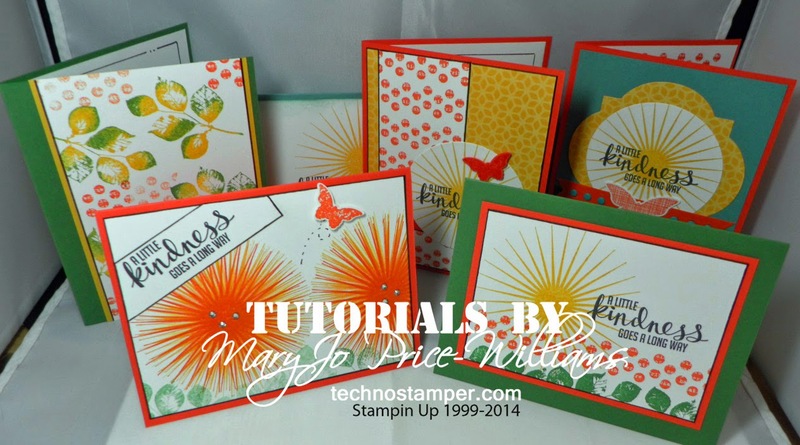 Today's tutorial will give you step by step directions to make five cards--one with each of the images in the set--and a matching box to store them in! I am so excited to get started again with my sketch challenges on Mondays! Thanks for the patience in waiting for the return--and for all the nice comments letting me know you missed it! In the meantime I thought it might be fun to get to know the new design team. I know these awesome blogs will keep you inspired a long time. I am excited to tell you that my Monday Lunchtime Sketch Challenge will be back up and running next Monday so be sure to come on over and check it out. 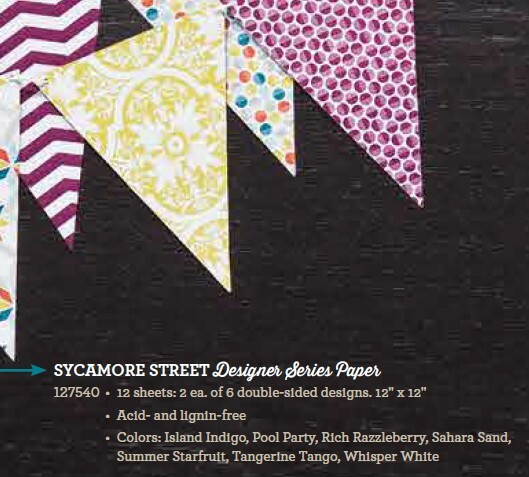 Have a new team of designers that will get your creative juices flowing like never before! 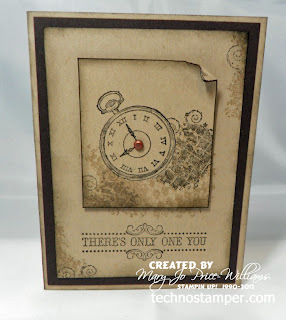 But today is Tuesday and that means that I have the Try Stamping On Tuesday sketch challenge for you today. It is a fun one! 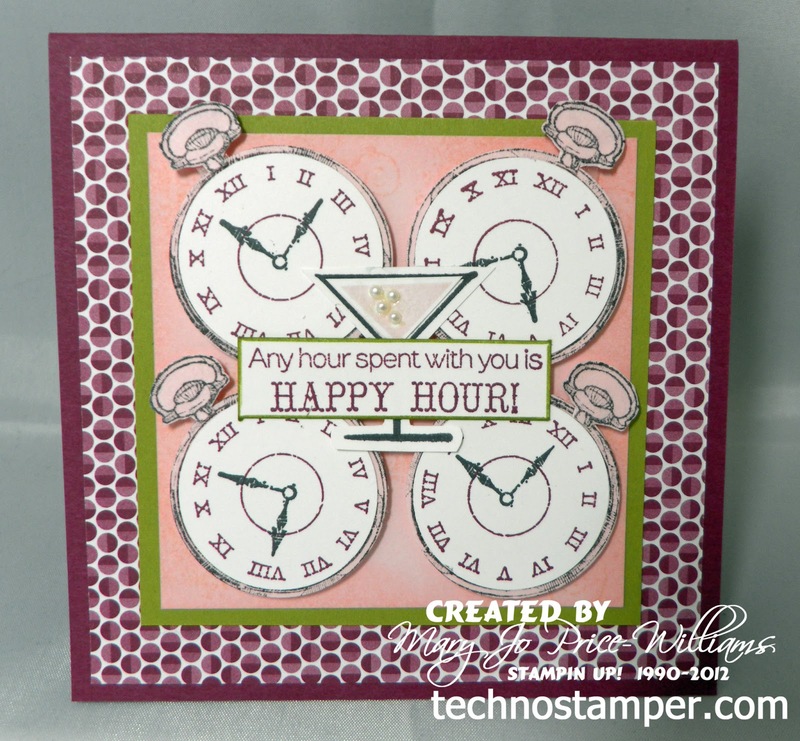 I am using the Clockworks set again but trying to make it more teen friendly. I am still not sure if I am loving the set or not but I am loving these colors! What do you think, is this set a yes or a no??? Be sure to head over to the Try Stamping on Tuesday blog to see what the rest of the talented team has done with the set. Thanks for stopping by--be sure to come on back next Monday for the return of the Monday Lunchtime Sketch Challenge. 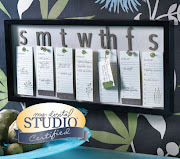 It's a mini class sent to your door! This is such an exciting program! 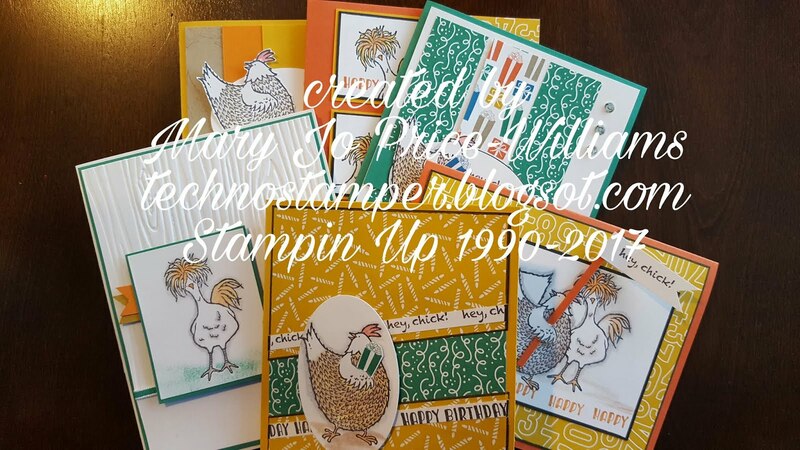 You can subscribe to the Paper Pumpkin and each month you will receive a surprise kit with EVERYTHING you need - stamps, paper (pre-cut), ink, accessories and full-color instructions to create a project (you will need your own adhesive.) from start to finish. 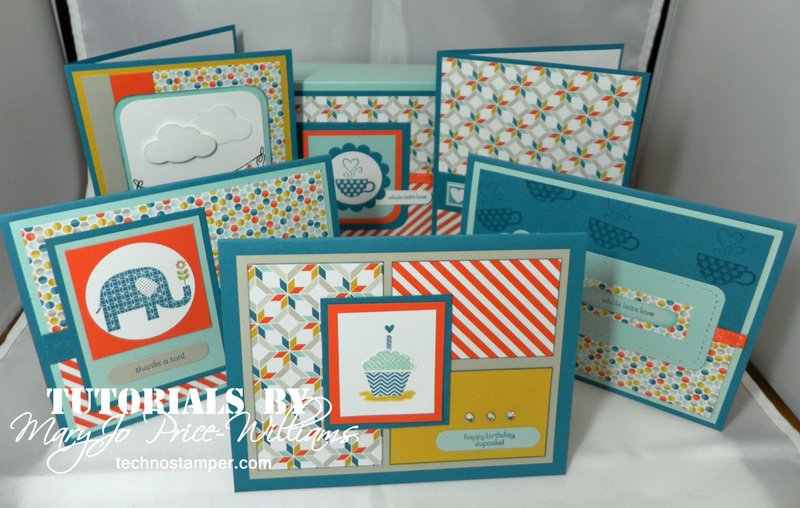 The projects vary each month from cards, to journals, to home decor, and more! Sometimes there are even exclusive products used JUST for these kits! These kits are also very flexible. If you decide you want to skip month, log into your account and choose "skip month" for as many months as you need. If you want to cancel - no hassles! Free gift in your very first kit! 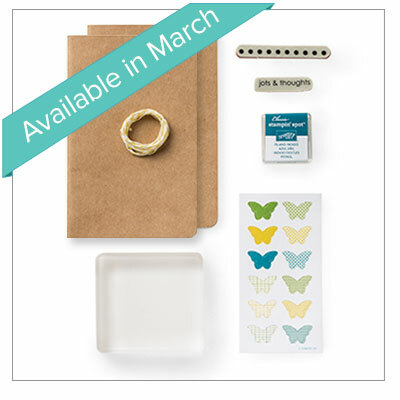 Also - your first month of membership you will receive a welcome kit and a free gift - a clear acrylic block! 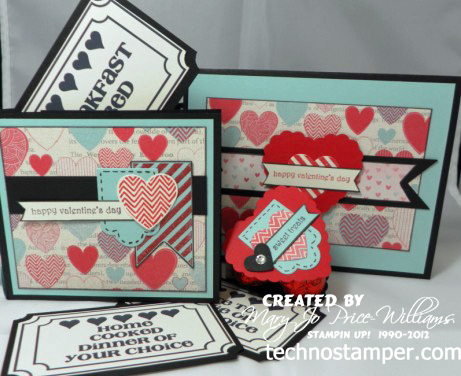 If you are unsure about whether or not you will like it, there is a Try It kit available in March. You need to sign up for a kit by the 10th of the month to get that month's kit. If you sign up on the 11th of the month, your first kit will come the next month. (Let's say you sign up on May 10th, we'll send your kit around May 15th. If you sign up on May 11th, we'll send your first kit around June 15th.) After you sign up your new monthly kits will automatically be sent to you for as long as you remain a subscription member. 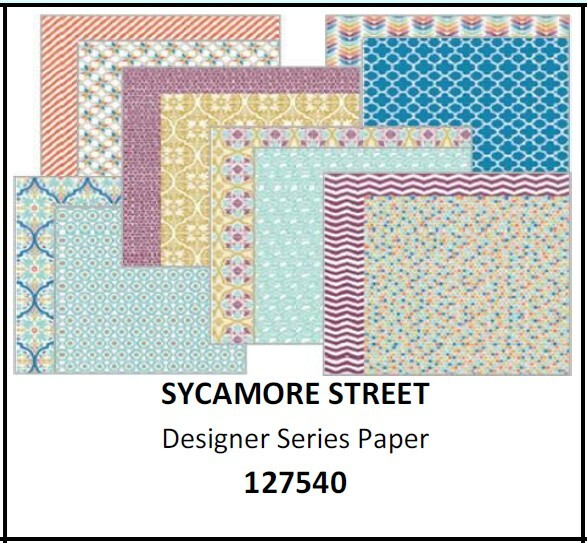 Check out My Paper Pumpkin and register today! 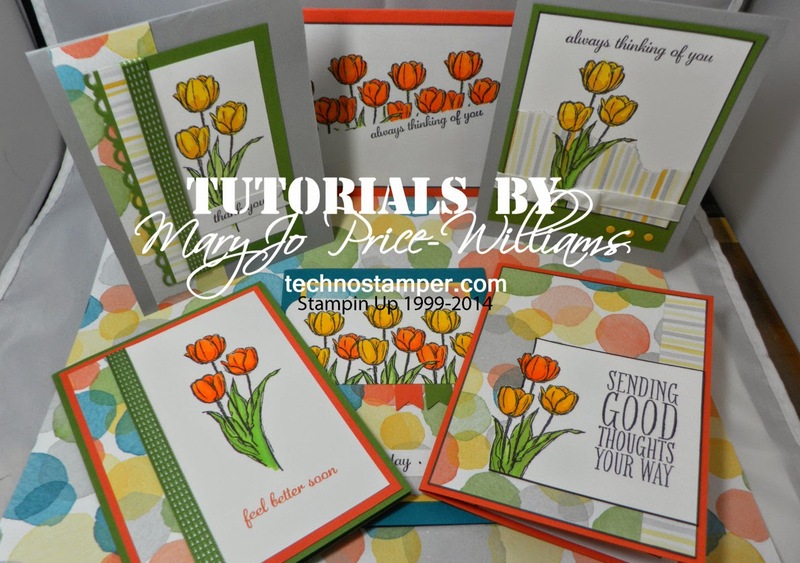 (Be sure to choose Mary Jo Price-Williams as your demonstrator when you register your account.) Drop me an e-mail letting me know you signed up and I will share other card ideas with you using the stamps from your kit! 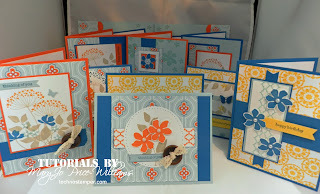 You are going to LOVE this--so easy and so fun! Happy Monday! If you are looking to see if I re-started my sketch challenge again--sorry, not yet--I am hoping that it will begin again next Monday or the first Monday of February at the latest. Thanks so much for your patient in this matter. I know you are all excited to play along, lol! 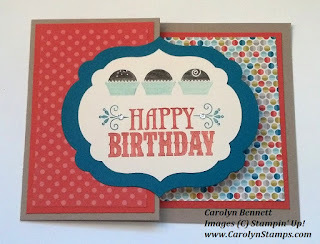 Fast post today--lots to do since my son is off school. Other: circle punch, dots embossing folder, framelits, 1 1/4 inch scallop circle punch. I am not sure if I have ever played along with this challenge or not. I know I always mean to but then I forget. 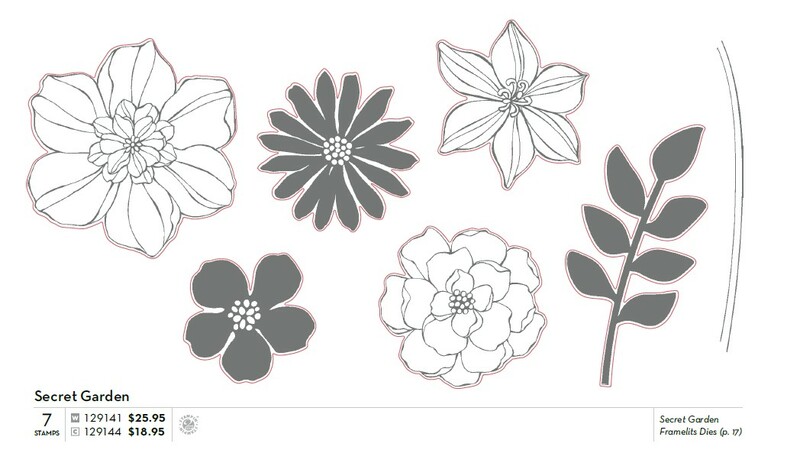 This week is a clean and simple sketch challenge. 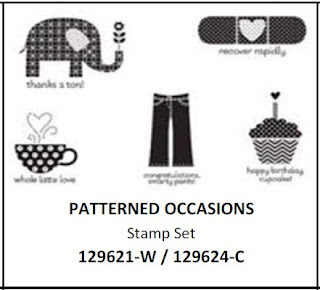 Just what I need for a masculine card and I am forcing myself to use a stamp set I bought way too long ago to admit to--when the new catalog first came out. (this is my first time using it) so what better way to get acquainted with the set than with a clean and simple sketch?! Here is the sketch...you can see the original challenge post on their page by clicking on the sketch below. 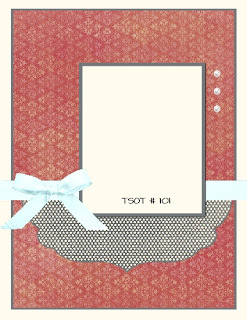 I am not really sure I like the card I created--feels like it needs something but I was really trying to keep it SIMPLE. Hope you had a great weekend! Glad to have an extra day with my son since tomorrow is a holiday--we are going rock climbing! Always a good time. What is up with me and the punch art lately??! Seems I always want to do punch art around Valentines because you can make such cute little critters with hearts. 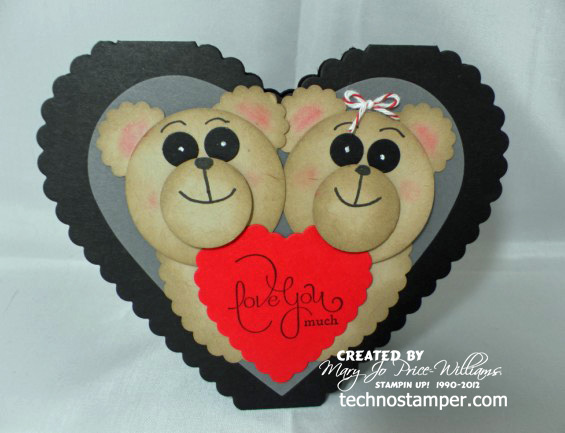 These cute bears are not made with hearts but they are on a heart shaped card and are holding a heart. Aren't they cute. 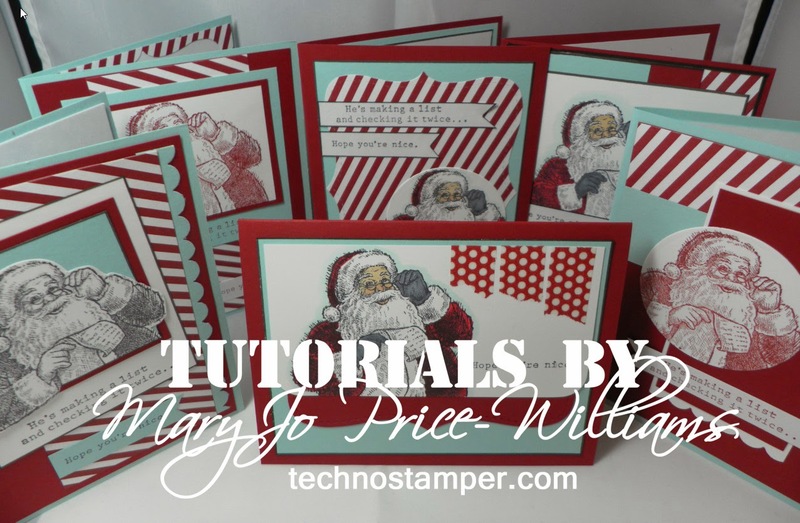 I had fun coming up with the idea and I even have a mini tutorial at the end of the post. 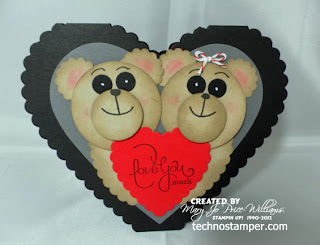 Want to know how to make these cuties??? 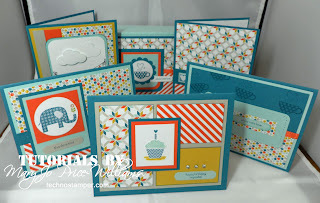 So I was so busy making Christmas cards during the Holiday Mini time frame that I only got to use this set once while it was current. 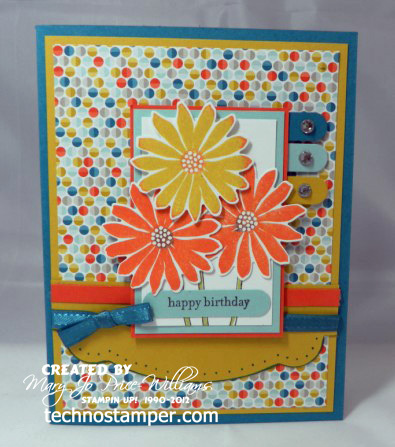 Actually I made this card the day before it retired so I guess I used it twice but only shared one. Go figure. It is a good thing I keep all my sets and use them all--retired or not. This is such a cool set wish I would have had a bit of time to play with it while it was current --I made this for a Chat and Challenge on SUDSOL. I always love Red, Black and White for Valentine's cards. 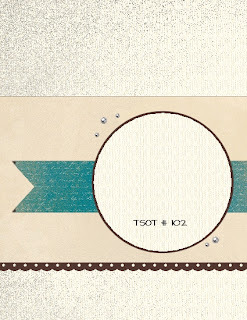 Other: rhinestone, sponges, black satin ribbon, ticket corner punch. Wow we had a few awesome days around here weather wise and it gave me an early dose of Spring Fever! I often wonder why I live were I live when I really do NOT like cold weather--but the last few years have been much milder and very enjoyable. I thank God for the few days that all of us sickly people were able to get some fresh air and get rid of some germs--he really does know what we need. Aren't those colors so fun! There are lots of brand new products being used on this. 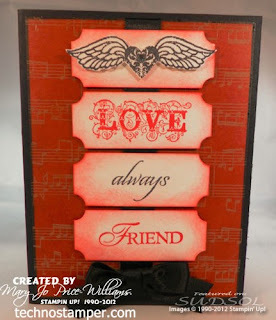 Don't forget to check out my newest tutorials on my side bar.